In White Stone just off the Chesapeake Bay, this delightful country home possesses an enviable location. Sometimes described as provincial, with a charming coastal village quality, this particular community also supplies superior amenities. Explore boutique shops, fine antique stores, eclectic gift shops or just go “junking’ in consignment shops, weekend flea markets, and yard sales. Walk or cycle the country roads, enjoy award-winning golf courses, discover bird sanctuaries and nature preserves and, of course…enjoy the water. Antipoison Creek, once home to generations of independent waterman, is just minutes from the Chesapeake Bay. The protected deep water provides an ideal harbor for any size watercraft. The wide creek extends outstanding water views and a natural setting with an abundance of waterfowl and wildlife. The relationship between indoor and outdoor spaces is easy and fluid with the views of the creek a constant presence. The poolside terrace offers a secondary living room with the backdrop of the glorious natural waterfront setting. The striking great room draws one to the spectacular views of this classic coastal setting. The many fine details that include gleaming exotic hardwood floors, stone fireplace, five-piece crown molding and walls of glass and white custom cabinetry convey an understated elegance. The space offers a versatility that welcomes an endless possibility of decors and fashion, from coastal casual to formal elegance. This gracious area has pedestaled columns to break up the spaces, yet relate them to each other. The polished kitchen includes striking, lighted cabinets, desk, upgraded cooktop, large refrigerator with panel doors. With plentiful counters of granite and a fabulous center island, this gracious space is a great place to gather. The raised granite counter with paneled wainscoting and custom cabinetry provide a stylish transition to the kitchen. 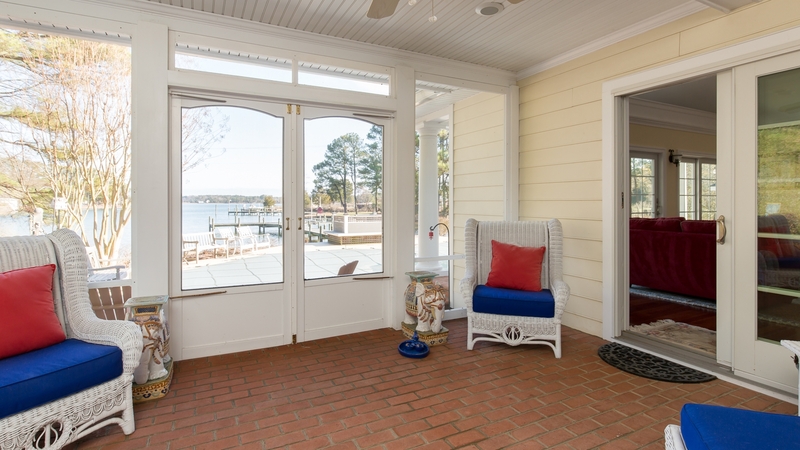 This wonderful breezy screened porch with brick floor and beadboard ceiling that is the ideal respite from the chaos of daily demands. The great room and master bedroom open to this porch to extend the living space to the outdoors. Check out Location, Amenities, Price and More Photos.